It’s time to work at a local pizzeria in Five Nights at Freddy’s : Minecraft Edition [FNaF : MCE] game! It can be played from now on. However, it is also being updated. It is made in Clickteam Fusion 2.5. Especially, the game will run on mobile devices soon, beginning with the release on Android. 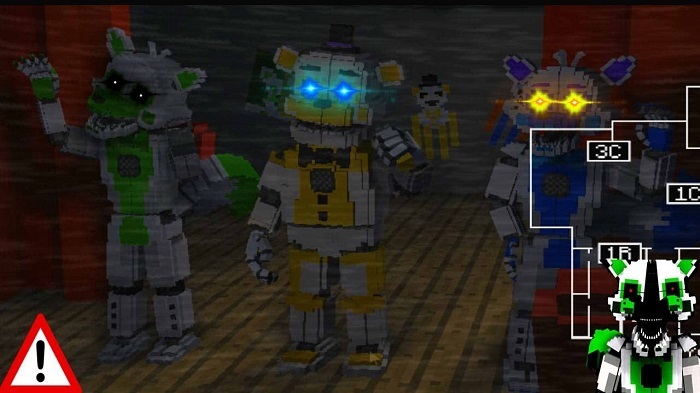 In FNaF : MCE, you have been hired and you will take the role of a night guard. Start the new job and try your best to keep you safe until the end! Note that your position has been opened after the mysterious disappearance of the previous employee!